The ‘Lost Paradise’ is a theme rich in the heritage of Bahrain. The concept is designed to entertain and to educate. With recreated Dilmun, Mesopotamian and Macedonian ruins, ancient artefacts and replicas of real historical sites the theme allows the opportunity to showcase Bahrain’s long and rich history in a fun and interesting way. 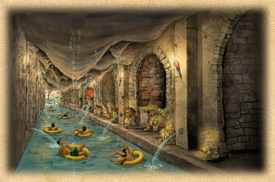 Due to the unique nature of waterparks, there are severalareas that must be addressed and accounted for at the design and drawings phase of the project. Experienced designers, artists and architects must advise clients regarding maximising the potential of the project within a specified budget and taking into consideration the local economic situation, geography, health and safety requirements, drainage, power and water supply, local custom and climate etc.